When you see a dancer perform, you only see what is in front of you in that moment. What you don’t see is the years of training both physical and mental, the struggle for perfection, the tenacity to achieve at any cost – you see only the magnificent, seemingly effortless, result. A ballet company is no different. A great company is built over generations on the accumulated knowledge and experience of thousands of teachers, dancers, choreographers, artistic directors and theatrical designers. When San Francisco Ballet presents its London season at Sadler’s Wells mid-September it might be interesting to reflect that it is the oldest professional ballet company in the United States and that maturity coupled with some particularly inspired management over recent decades has seen the company journey from regional excellence to the very highest international acclaim. The company was formed in 1933 to provide dancers for the San Francisco Opera and to give stand-alone dance concerts as well. For the first 30 years most of the repertoire was choreographed by whoever was the artistic director at the time, as was the case with many dance companies. The first director, Adolph Bolm, choreographed some thirty works including three operas from 1934 through 1936. Willam Christensen started providing most of the new ballets (thirty-five over the next fifteen years) in 1937, then became artist director the following year. His brother Lew, who had been dancing for Balanchine since 1935 in the American Ballet Company, Ballet Caravan and New York City Ballet as a principal dancer, moved to San Francisco in 1951 and joined Willam as co-director. The next year Willam left to start the dance program at the University of Utah in Salt Lake City, leaving Lew in charge as the sole director. In the following thirty-four years, until his death in 1984, he choreographed fifty-five new works for the company. 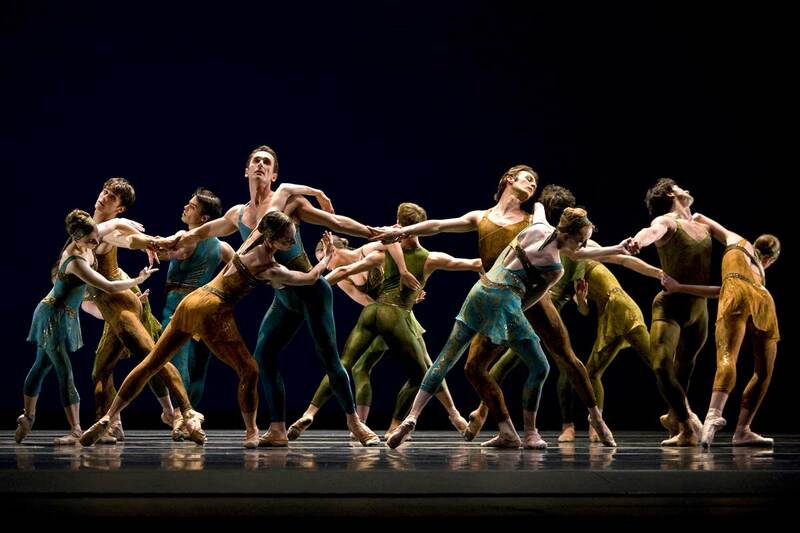 San Francisco Ballet in Balanchine’s Divertimento No.15. A dance company is only as good as its repertoire and its dancers. Fortunately for San Francisco Ballet it had two major assets that aided in developing a solid collection of works. In 1952 Lew started an exchange program with his mentor at NYCB, bringing twenty-two of Balanchine’s works to the West Coast over the next 32 years. This tradition continued under current artistic director, Helgi Tomasson (interview), also a former principal dancer at NYCB, who acquired another sixteen by Mr. B and twelve ballets by Jerome Robbins. In 1960 a new phase was ushered in when Lew and Michael Smuin, then a 21-year-old dancer, inaugurated the summer choreography workshop series that encouraged the dancers to try their hands (and feet) at creating new work. After the spring season was over a small chamber company of dancers produced a summer mini-season to enthusiastic reviews. The popular series continued until 1973 when the main company became so busy itself that there was no time off during the summers. Though the formal program ended, its essence continued and a large percentage of premiering works were created by the company’s own in-residence artists. The sheer number of new works and choreographers over the past seventy-nine years of the main company and the workshop series is staggering – more than 600 ballets by more than 150 choreographers. Another benefit of that generosity proved to be far-reaching in developing choreographers who went on the make ballets for, and become directors of, other companies. Smuin himself became co-director with Lew in 1973 and created thirty-seven ballets before he was let go in 1985 when Tomasson took over the helm and subsequently contributed over forty ballets to the repertoire. From the beginning most of the dancers at San Francisco Ballet were Americans, though there was always a sprinkling of others from places like Russia, Hungary, and Latin America. Just over twenty years ago the sprinkle turned into a gentle rain as Tomasson showed a keen instinct for recruiting international talent. The company now boasts of a very fine stable of thoroughbred dancers who come from all over the world, often graduates of the most prestigious ballet academies. Of the thirty-two principal dancers and soloists, only a quarter of them are Americans. The rest consist of four from Spain, a quartet of Cubans, three Russians, a trio from France, two a piece from Brazil and Australia, and the rest from China, Japan, Canada, Estonia, Armenia and Italy. An authentic United Nations of dance. But longevity isn’t everything. There are quality of life issues to consider and this company seems to be reveling in a second childhood instead of becoming a tradition-bound elder. Not content to present just the evening-length classics, or even the mid-to-late 20th century shorter masterpieces by Balanchine, Tudor, Robbins, Ashton, Macmillan, Kylián, van Manen, and Forsythe, Tomasson is eager to commission new work from today’s leading international choreographers – Alexei Ratmansky, Mark Morris, Wayne McGregor, Christopher Wheeldon and the company’s own choreographer-in-residence, Yuri Possokhov, as well as from other emerging artists. Unless you suffer from extreme narrow-mindedness, you are bound to find a ballet on most programs that stimulates you emotionally, intellectually or aesthetically. San Francisco Ballet in Wheeldon’s Number Nine. When the company was last in London in 2004 they brought eleven ballets by six choreographers. The repertoire leaned toward the more classical/neo-classical with four by Balanchine – Allegro Brillante, Ballo della Regina, Square Dance, Four Temperaments – and Petipa’s Paquita Pas de Trois set by Makarova. The remaining ballets by Tomasson, Possokhov, Ratmansky and Wheeldon were in a more up-to-date vein. Frances Chung and Pascal Molat in Page’s Guide To Strange Places. This time the range of styles is even greater and each of the three programs has a good mix of choreographic flavours. Divertimento No. 15 (review), the Balanchine work set to Mozart, of course, is especially classical and exquisitely danced by this troupe, and segues smoothly into Liang’s sweeping Symphonic Dances (review) to Rachmaninov music of the same name. Tchaikovsky’s Souvenir de Florence is the landscape for Tomasson’s Trio (review), a romantic and moving work that contrasts sharply with Page’s Guide to Strange Places (review) accompanied by John Adams’s eponymous score. Morris offers an all-male cast in Beaux (review) which shows both the competitive, athletic side of men and a more supportive one of a tightly knit group, while Possokhov reveals his own two very different faces in Classical Symphony (review) and RAkU (review). The first an invigorating neo-classical homage to his Bolshoi roots set to Prokofiev’s symphony and the second a very dramatic piece of dance theatre employing intense visual effects and innovative steps. If you are a Wheeldon fan, there is one of his ballets on every program – the exuberant Number Nine (review), the other-worldly Ghosts (review) and the finely crafted Within the Golden Hour (review). And all of them performed by some of the finest dancers in the world.